If you have a brain tumor or suffer from one of the several neurological disorders that can be treated with Gamma Knife® radiotherapy, you can expect pinpoint accuracy with minimal pain. Despite the name, The Gamma Knife® is not a knife at all—in fact, the procedure is done without a scalpel or incision. Also called stereotactic radiosurgery, it is a radiation procedure that treats brain lesions with enough radiation to control them. The treatment also targets only the specific areas needing treatment, while allowing your physician to avoid healthy surrounding tissue. Our Gamma Knife® Icon machine is the latest in Gamma Knife® therapy. It combines the best of everything we have learned about radiosurgery in one machine. Winship Cancer Institute at Emory Saint Joseph's Hospital is the first in Georgia and only one of seven in the nation with a Gamma Knife® Icon device. Gamma Knife® technology targets a tumor, or other problem areas in the brain, with incredible accuracy. It delivers focused radiation beams, providing precise targeting that can avoid dose to critical brain structures. Gamma Knife® treatment can often help you avoid surgery and/or whole brain radiation therapy. As a result, patients are offered an outpatient procedure with minimal side effects and risks. However, even knowing that you will be treated with today’s best equipment and technology, you may still feel anxious. Rest assured you’ll have a highly skilled team by your side. Your treatment team, consisting of a neurosurgeon, radiation oncologist, physicist and nurse will be with you every step of the way to make sure you are comfortable throughout. Throughout the procedure, you will lay on a comfortable mattress and your head will be precisely positioned. You may even be able to sleep during treatment. Treatment lasts anywhere from 20 minutes to two hours, and you can go home the same day. To make an appointment, please call 404-778-1900. Our team will review your information and provide a more complete response when we return your call, which we will do promptly (usually within a few hours). We will ask you questions about you and your diagnosis, answer questions regarding your visit and help you schedule an appointment. 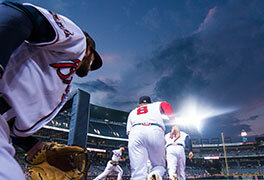 The partnership provides the Atlanta Braves with comprehensive and seamless state-of-the-art medical care. This includes access to Emory’s world class Sports Medicine, Orthopaedics, and Spine Center physicians and more.